BOSTON, MA -- The 2018-19 Eastern Hockey League Premier (EHLP) season rolls on this week, with 11 more games on the schedule through Sunday. Tonight features a New England Conference matchup between the Boston Jr. Rangers and Valley Jr. Warriors, and then there are 5 games scheduled per day on Saturday and Sunday. The battle for the final playoff spot in the Mid-Atlantic Conference continues on Sunday in Lancaster, PA. The Renegades and Panthers hit the ice for their third matchup of the regular season, after they split their home-and-home series back on November 17th and 18th. These 2 teams have a pair of home-and-home series still left, before the end of the 2018-19 regular season. Below you'll find the full weekend schedule through Sunday. The next set of TSR Hockey Stars of the Week will be released on Monday, December 10th. 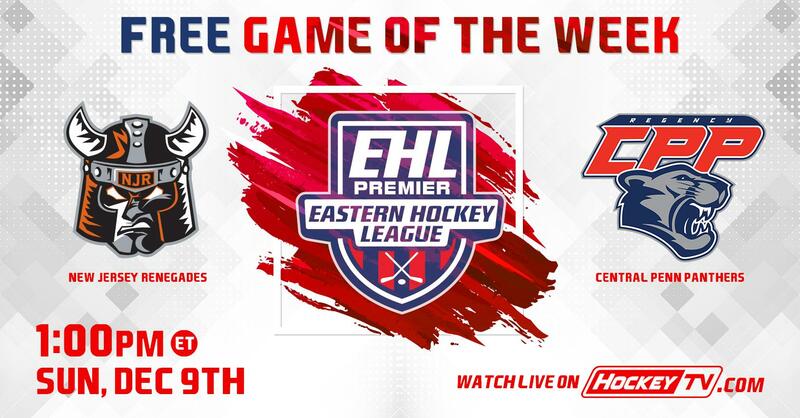 Remember to catch the #Eshow all season long on HockeyTV.